Something real is happening in our 6th-grade dance classes. 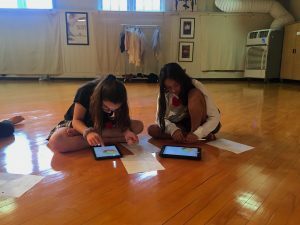 Inspired by the hashtag #freedomforgirls and Beyonce’s Facebook post sharing Global Goals’ new music video to her own song “Freedom”, our girls have taken real-world issues and turned their paraphrased research into paraphrased dance. The end of the music video challenges the viewer to help in fighting for a series of “global goals” by the year 2030 and our girls jumped and pirouetted at the chance to try. 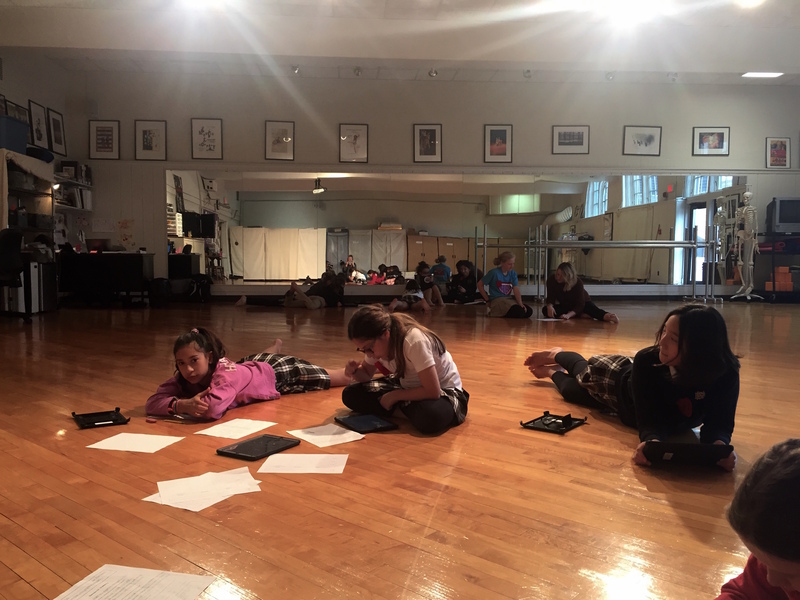 Working in groups to create pieces that raise awareness about an issue, the girls are using their dances as a call to action. The International Day of the Girl music video cycles through many shocking facts that surprised and confused the girls. How did we not know this was happening? How can we spread this information? The first question was one that prompted the dance teacher, Lisa Yanofsky, to ask for my help to co-teach two of her classes, and we held our first ever dance/research class in the dance studio. The librarian’s presence in the dance studio was met with some confused and concerned faces; but as I reminded the students of our digital resource tools, it was great to watch their faces as they made the connection that they could use the tools in ANY subject or situation, not just history or science research. As they delved into our databases, researching injustice against girls, our girls began to ask and answer more and more questions. Learning that girls who are forced into marriage as a child don’t have beautiful elegant white dress weddings as they imagined but instead are overpowered and not free to have thought or education (“Is this the beginning”). Discovering that, at least, one member of their group of four could experience domestic violence in her lifetime (Cloos). Realizing that the gender wage gap affects everyone, even female soccer teams (Das). Attempting to understand the difference between education as a right and as a privilege and who is helping protect the right (“Girls Education Network Launch”). Primarily using Gale databases, our girls collected facts and figures they believe would be impactful to their audience. All ideas that they never imagined researching in “dance class”. During our next dance/research session, they worked independently to paraphrase their facts and develop an opinion based on each fact. The next step was to take that research directly into the creation of their movements. Literally moving the paraphrased fact into a paraphrased motion. Listening to them plan out their movements was really wonderful and seeing facts of 1 in 4 become visual ideas and movements was fascinating. The girls connecting that they could show the weakness of policy changes by becoming weak in their movements was something I have never experience in a research paper. I would love to do more projects that move researching outside of the core subject and into passion-based projects. If it wasn’t for Lisa’s project ideas and invitation into her dance studio, I would not have experienced this amazing project. The girls are still working hard to perfect and complete their dance but I hope you enjoy this short sneak peek of their #freedomforgirls dances. Cloos, Rhonda. “Domestic Abuse.” The Gale Encyclopedia of Public Health, edited by Laurie J. Fundukian, vol. 1, Gale, 2013, pp. 256-258. Global Issues in Context, link.galegroup.com/apps/doc/CX2760500075/GIC?u=lnoca_hb&xid=5037e6f7. Accessed 1 Dec. 2017. Das, Andrew. “Female stars accuse U.S. Soccer of unfair pay; 5 players file suit, saying women’s team earns less despite a better record.” International New York Times, 1 Apr. 2016. Global Issues in Context, link.galegroup.com/apps/doc/A447947119/GIC?u=lnoca_hb&xid=ed64bd3b. Accessed 1 Dec. 2017. “Girls’ Education Network Launched [press release].” Africa News Service, 12 June 2017. Global Issues in Context, link.galegroup.com/apps/doc/A495426699/GIC?u=lnoca_hb&xid=a65835d6. Accessed 1 Dec. 2017. “Is this the beginning of the end of child marriage?” CNN Wire, 16 June 2015. Kids InfoBits, link.galegroup.com/apps/doc/A430185596/ITKE?u=lnoca_hb&sid=ITKE&xid=c5d0b2a1. Accessed 1 Dec. 2017. This entry was posted in Uncategorized by Kati Corbitt. Bookmark the permalink.